Both the Diario and Journal report that Miguel Albuquerque, President of the Regional Government, will today visit the specialist export unit for Anona, located in the horticulture centre in Santana. 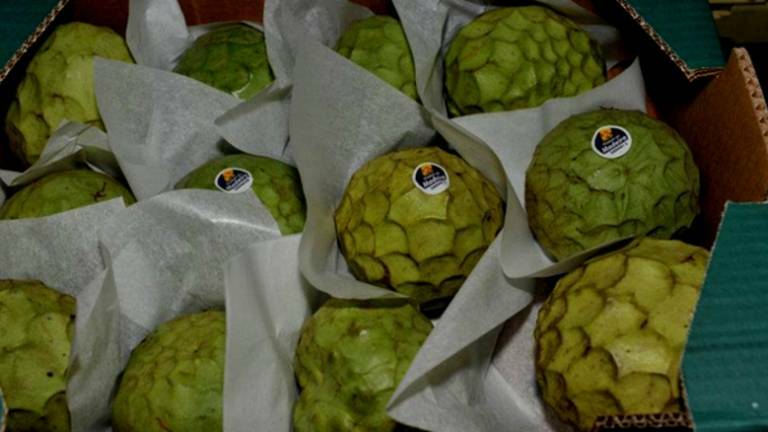 The unit represents an investment of around €100,000, and has the capacity to process around 3,000 kilos of the “custard apple” per day, with the potential to export about 40 tons in its first year. Investments have been made in customised boxes (Anona da Madeira) and modifications to equipment. It is expected to proceed on the same site with the export of avocado next year. 28 Anona- related projects have been approved through the PRODERAM, the rural development program, four involving organic production of Anona. Protected Designation of Origin status of the Anona grown in Madeira also identifies the source of the product and protects it under European law. All exports are carried out by freight aircraft. Regional statistics reveals that in 2017 the productivity of this fruit tree increased, with total production amounting to about 1,316 tons. In the same year, the Regional Directorate of Agriculture supported the Anona producers, with pruning and grafting, respectively, in 8,896 and 330 anoneiras, covering a total of 175 farms/farmers. We never see them in East London where I live. We get all sorts of “exotic” fruits & veg too!